Sideloaders are very safe, with the operator above and to the side of the load, protected by a robust cab and grill. Wet disk brakes give added durability and security, whilst grab handles, generous steps and excellent visibility makes the operator space a comfortable place of work. These machines offer incredible durability and are highly engineered for years, if not decades of use. Such performance doesn’t come cheap, but resale values are high, meaning the investment is well worthwhile. Other sideloader manufacturers may cut back on steel or spend less time on product development, but with Baumann, performance is guaranteed. The Baumann cabin is a comfortable and highly ergonomic space. Hydraulic levers are naturally placed to the driver’s right who also has a multi-adjustable armrest for optimum comfort. Visibility is excellent and a host of cabin options provide excellent upgrade potential. The most popular models feature hydrostatic transmissions with large load sensing pumps, to provide a smooth operation and operator experience. A WORLD-CLASS MANUFACTURER WITH A REPUTATION FOR CONSISTENT INNOVATION, AND THE HIGHEST LEVEL OF DESIGN AND PRODUCTIVITY. 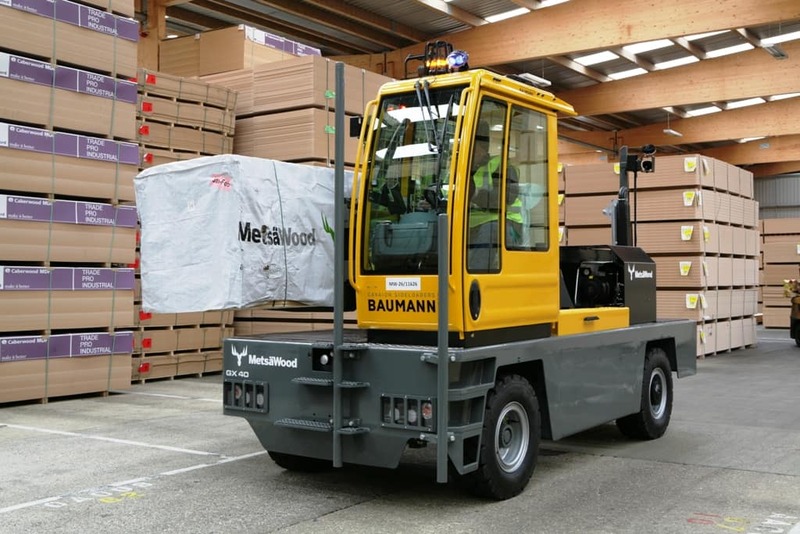 Baumann, the world’s largest sideloader manufacturer. It has been at the forefront of developing new sideloader technology, offering very low maintenance and operating costs, together with a load-levelling system that enables the machine deck, load bed and forks to remain perfectly level at all times, even on rough terrain or slopes. In 2016, the company won a Fork Lift Truck Association award for Innovation, for its Archimedes screw outreach system, one of the most significant developments in sideloader design in 40 years. Despite being considered one of the most respected and reliable brands in the sideloader sector, the Baumann brand has suffered from confusion brought about by the sale of its German service arm in 2007, and subsequent attempts by competitors to utilise the Baumann name. The factory itself, established in the late 1960s, has responded by adopting the name of its birthplace on the shores of Lake Garda, Cavaion. The fledgling business took just six months to produce its first model. A family company to this day, Baumann now sells its 3 to 50 tonnes sideloaders worldwide through 106 dealers in 76 countries.